Artisan Roast is a chain of three coffee shops, two in its home town of Edinburgh (Broughton Street and Bruntsfield Place) and this one, on Gibson Street in Glasgow’s West End. Compared to the other branches, it’s massive, although that’s not too much of an achievement, since both of Edinburgh’s Artisan Roasts are fairly compact. Nevertheless, the sense of space afforded by Gibson Street was refreshing. Despite its size, it manages to have the same sense of intimacy, largely due to a clever partitioning of the store into multiple, smaller spaces, which includes a mezzanine. Generous windows, running from almost the floor to the (very high) ceiling, make the front of the store a very bright space, helped by a large mirror over the bench opposite the counter. This is in stark contrast to the back, where the lighting is (deliberately) subdued, adding to its sense of intimacy. 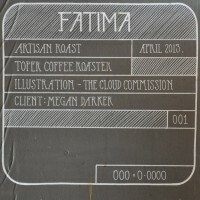 Until April 2013, Gibson Street roasted all its own coffee in a Toper called Fatima which sat at the far end of the counter. Then Artisan Roast centralised its roasting in Edinburgh, freeing up space for Gibson Street to do more food. It now has the best food offering of the three. November 2015: Artisan Roast is now a chain of four, with a third Edinburgh shop opening in Stockbridge in March. Stepping inside Artisan Roast, it actually feels quite small, seemingly not much bigger than either Broughton Street or Bruntsfield Place. However, like them, it’s a space that encourages exploring. In place of the Mooches (the back rooms in the Edinburgh branches) Gibson Street has a mezzanine level, with the added advantage that this creates another intimate space beneath it. The stairs to the mezzanine are in the centre, further dividing upstairs and downstairs in two, which is particularly noticeable downstairs. Outside on the pavement there are benches either side of the glass double-doors, mirrored inside by window-bars. To your right and ahead of you is a large, open-plan, L-shaped counter, effectively funnelling you to the centre of the store where you order your coffee. Opposite the counter is a wooden bench with a pair of high tables, while the right hand-end of the counter, opposite the window, has a row of stools. The espresso machine, business-end facing the customers, is behind the counter to your right, while the bottom of the L, now to your left, holds a comprehensive brew-bar, complete with massed ranks of bags of coffee for sale. Venturing past the brew-bar, you find the rest of the seating. There’s an open area behind the brew bar, plus a small extension to the main counter which is the food preparation area. You can perch here on one of three stools if you like, watching either the food or the brew bar, whichever takes your fancy. Beyond that you have a choice of the mezzanine or the intimate spaces below it on either side of the stairs. Downstairs has an eclectic range of tables of various sizes, with a selection of chairs and stools arranged in a vague horseshoe around the stairs. Upstairs, the layout is similar, with an equally eclectic (but different) set of tables and chairs, including padded benches and a sofa. Regular readers will already know where I ended up. I liked all of the spaces, but nothing quite beats sitting at the front of the mezzanine, the rest of the coffee shop laid out below you. I started on a bench with a packing crate as a table, but I kept banging my knees on it, so I switched allegiance to the more conventional tables on the other side. In keeping with the other two branches, wood features heavily throughout. All the furniture is wood, as is the counter, floorboards and stairs up to the mezzanine. This is coupled with the judicious use of coffee sacks for decoration. Artisan Roast has a range of coffee beans for sale. I wanted to try one as a filter coffee (through V60, cafetiere, Aeropress or Chemex), but the grinder was playing up on the day I visited. Instead I had a piccolo with the guest espresso, a Sumatran single-origin. This went well with the milk (as the barista had suggested it would). It was quite a strong coffee, resulting in a slightly bitter, dry drink that I really enjoyed. I paired it with a slice of banana and walnut cake that was truly excellent. The cake had a wonderful consistency, not too dense, but not too fluffy either, while the buttercream icing added just the right amount of sweetness which combined well with the walnuts and banana. If you’d like to know more about Artisan Roast, then try this interview with Maria Szeklicka, Artisan Roast’s Operations Manager, part of an awesome series by Scotland Coffee Lovers on women in speciality coffee in Scotland. This entry was posted in Breakfast, Cafe/Roaster, Cafes, Cake, Evening Opening, Glasgow, Lunch, Sandwiches and tagged include by Brian Williams. Bookmark the permalink. The light fittings look a bit like Gramophone… horns?